Cut roast into steaks in place in zipppered storage bag. Mix together marinade ingredients until well blended. Place marinade in bag making sure meat is well covered. Refrigerate for at least several hours. Remove stem and seeds from peppers and cut into strips. Place on skillet over medium high heat and add olive oil. Take each steak and place on skillet cooking about 3 minutes per side in order to get nice crust. Remove steaks from pan and set aside. Shake onions and peppers in marinade bag then place in skillet. 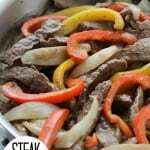 Slice steaks across the grain into thin strips and return to skillet with vegetables. Open tortilla bag and microwave 1 minute to heat.